Our volume purchasing has given us better prices to pass along to our customers. 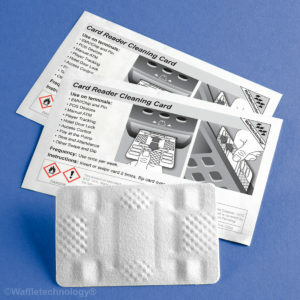 This Waffletechnology® cleaning card is designed to the clean read pins located inside all smart card or EMV (chip and pin) Card Reader, as well as the magnetic stripe reader. The sensitive pins allow communication between the credit card and the card reader; keeping these card reader contact pins clean is essential to the POS (Point of Sale) Card Reader ability to read information from the card. Use this product once per week to help avoid credit card misreads. Don’t be confused by lower prices elsewhere. They are shorter and do not clean as deep or as well and do very little to keep your expensive card reader working correctly. Package of 4 each.